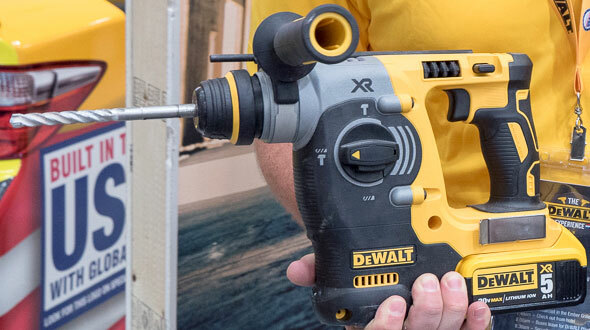 Dewalt has come out with a new 20V Max brushless rotary hammer, DCH133. It delivers 2.6 joules of impact energy and has a 1″ drilling capacity. Its optimal drilling range is 3/16″ to 5/8″. From the product photos, it has a rotary mode and a hammer + drill mode. Since it offers chisel rotation, I’m presuming it has a chisel-only mode as well. I was curious why there has not been a tool review (that I’m aware of) of DEWALT DCH133B, the price seems to be pretty good, compared to DEWALT DCH273B. But just curious if the performance is comparable? Is this a lower quality? I am leaning towards 273B, but second question about this drill: why does it not appear to have the same removable chuck as DCH274. I’m aware that DCH274 is for the UK but disregarding the 120V & 240V differences in power supply, why does it have the removable chuck and the North American one doesn’t? The DCH133B just came out, and I’m not sure it was officially announced yet; I can’t find a press release in my inbox. 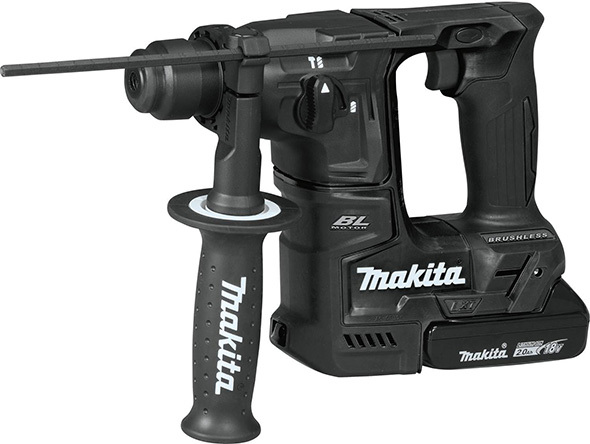 I did find a World of Concrete 2017 press release that talks a little about the new 60V Max FlexVolt rotary hammer – which comes bundled with a 9.0Ah battery pack – as well as a bunch of other soon-to-launch rotary hammers and demo hammers. Anyways, the DCH133 is new, that’s all. Why isn’t it on this list? I don’t know. Compared to the brushless DCH273 – the one that’s previously released and not the one that’s coming out with onboard dust extraction – the DCH133 is faster and more powerful. So, at least on paper, the DCH133 should be a higher performing tool. I honestly don’t know why the DCH274, similar to the DCH273 but with a removable chuck, isn’t available here. If I asked Dewalt, they would likely give me the cookie cutter answer that a lot of brands give when asked similar questions, that they’re catering towards regional tool preferences and user demands. The thinking could be that the removable chuck is a feature that most US-based users would not want to pay more for. Back to DCH133 vs. DCH273. The DCH133 should perform better, based on its on-paper specs, but it’s also a longer tool, not “L-shaped” as the DCH273. Can anyone remark about their experiences with longer rotary hammers vs. compact rotary hammers of similar power? This is any area I’m not too familiar with. I’ve experienced very low vibrations with compact rotary hammers, and haven’t used enough D-handle rotary hammers for comparison purposes. I think that the D-handle geometry might be better for certain applications, as it places the handle and auxiliary handle positions further apart. Dewalt’s product description say nothing about the DCH133’s vibrational dampening, and it’s kitted with 4.0Ah battery packs (DCH133M2) rather than the newer 5.0Ah that the DCH273P2 comes with. I wouldn’t consider the DCH133 to be a lower quality model, but it does look to be a less premium model. The DCH273B is priced at $285 for just the bare tool, compared to $151 to $190 for the DCH133. The DCH273 looks to be the more premium design with a compact geometry and active vibration control. It’s not going to perform as quickly as the DCH133, but it’s a great tool. I used the DCH213 a bit, with very good experiences. After that, the DCH253 came out, and it seems that the DCH273 is far more available. You also have another big boy coming out, the DCH293R2 6.0Ah kit, priced at $599 for the 2-battery kit. It has a 1-1/8″ capacity and compact design, plus an electronic clutch and active vibration control. I’ve used my share of hammer drills and rotary hammers, but it’s not the kind of tool I use frequently. I don’t think I have any corded or cordless test samples around here – everything these past few years have featured compact geometries. Have I ever used a corded rotary hammer? I don’t think so. I own a nice Bosch corded hammer drill, but apples vs. walnuts. Dewalt is coming out with lots of new rotary hammers, including a version of the DCH273 that comes with a dust collector ($629 via Amazon). Don’t worry – it looks like you can buy the D25303DH dust extractor separately, to fit to existing DCH273 rotary hammers. It’s $143 via Amazon. I think I’m more confused about the DCH133 than when I started writing up this preview post. It doesn’t look to be a “lower quality” model, otherwise it probably wouldn’t have been engineered with a brushless motor, but it also looks to be a less premium option than the DCH273. It does have higher specs and a lower price point. If money isn’t an issue, I’d go for the DCH273. Based on the marketing info, I’d conclude that the DCH273 offers superior vibration control, plus there’s the new on-board dust extractor you can use it with. The DCH133 can work with the D25301D, which requires a dust vac. « Buy or DIY, When to Throw Time & Effort, or Money at a Project or Need? DCH133 does indeed have a chipping only- mode. I found the info on DeWalt’s finnish website. I have one that I bought in that starter kit and get 2 free tools deal that Amazon had. Thanks for the heads up ToolGuyd. What questions do you have…. I staring at it shiny and new in my hot little hands now. For straight up drilling holes in masonry and concrete, the compact drills seem to handle better in the hands/one handed if you really need to reach. If you are going to be mainly just drilling holes, the compact ones have a better balance. It is easier to chip with a d-handle unit, they just seem to offer more control in this respect. So ithe sort of depends on what you see your needs as. I’ve got the DCH133 that was part of the 2 battery deal. I picked up cheap SDS removable 1/2″ dril chuck off Amazon for about $10, ordered a Bosch but it was never delivered. I bought the chuck for power auger bits for drilling holes in Railroad ties and for Milwaukee Hole Dozer bits in joist and such (thanks for headsup on the E-rebates from Milwaukee last year— still waiting for 12v Milwaukee sawzall E-rebate to be delivered). I will say that the SDS drill chuck, makes the tool rather long, even moreso with a 12-18″ bit. But since it not a daily use tool not a huge issue. But it does a nice job driving rebar or grounding rods with a sds socket adapter. I have both hammer drills the 133 and 273. You are correct the 133 has no vibration dampening system like the 273. If you notice when you pull the trigger on the 273 the hammer mechanism does not engage right away until the motor is depressed on the units anti vibration mechanism. The 133 has its hammer going from the start. 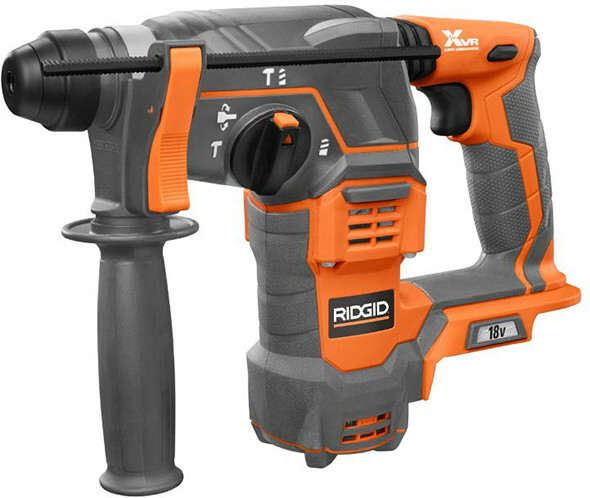 The 133 is also not a premium drill because it dosent have the XR branding rather has the brushless branding the same as there new value oriented brushless kit the DCK277. Thanks Stuart for posting this, very well written synopsis. I was leaning towards the DCH 273 to begin with, and after reading this post and reviews its solidified my choice ( I overlooked the XR branding, thanks John for pointing that out, and your opinions). I’m an electrician, and I don’t need a SDS Hammer Drill everyday, but when I do it would sure pay to have a cordless. Currently I am using a corded Bosch 11224VSR 7/8-Inch SDS-Plus Bulldog Rotary Hammer. No issues with performance, but its just the cord. In the winter when I have four 1/4″ holes to drill and I have to string out 50ft of extension cord, my patience wears thin, haha. Also I’m all in on DeWalt 20V with eleven batteries, so its a no brainer. I think that the lack of consistent XR labeling is like a simple oversight by DeWalt . The retail box the DCH133 has the XR labeling as does the DeWalt Website, and the tool looks like it has an empty space for a label (as opposed to paint/powder coat on Mg gear casing on some XR tools). I ordered one during the Amazon two bare tool with starter pack deal (thanks, Toolguyd, for explaining how nice that combo could be!). The only times I need a rotary hammer are drilling into concrete pad from above, or into stone decorative walls around the house, so a little extra length was a non-issue for me. I am glad I have it, I would not have bought a DCH273 at the current price and I have no need to own a SDS-max version. I also wanted to use it to chisel and hammer, so it was far superior to a hammer drill for me. I also got this drill with the starter kit deal after seeing it here, thanks. I have used the drill for over head drilling in concrete and it works really well. I have not used the other dewalt mentioned but the 133 drills quickly and handles nicely for me. Hmmm…should I sell/trade my Fuel version for this? The Milwaukee version is longer and has slightly greater impact energy, but let’s be honest, I have little to no need for a rotary hammer right now other than “it’s there IF needed”. 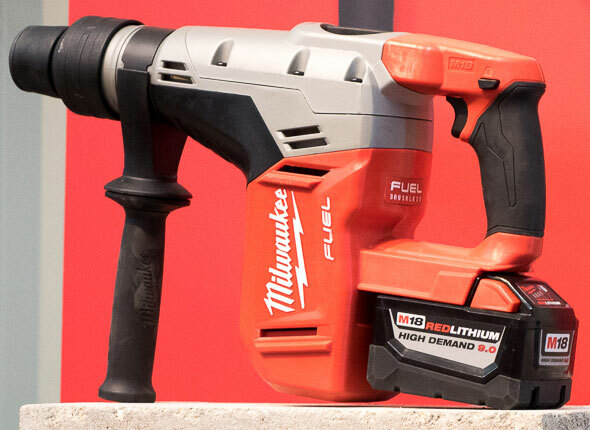 I’m heavily invested into DeWalt, but have only the rotary hammer and a single 5.0Ah pack to show for Team Red, so until/if more Milwaukee tools and batteries are added, this tool would be a great addition (again, if purchased at little to no out-of-pocket cost). Then again, if I keep the Fuel rotary hammer, I have an excuse to expand in that brand as well! I just purchased the DW 133 for home DIY use as my basement walls are 35 year old concrete with rebar so tough to drill into. I have a corded Bosch 1191VSR which I’ve had no problems with, but it does struggle with my basement, hence I bought the DeWalt. Was looking at a refurb Milwaukee, but the DW on Amazon was only $15 more so seemed like a no-brainer. However, the DeWalt does not seem to offer a great improvement over the corded Bosch. I’m only drilling 5/16 for small tapcons. I would think that the DCH133 would outperform the 1191VSR, definitely when drilling larger holes, but perhaps the difference would be lesser when drilling smaller holes. The battery can make a difference with some brands. I’d use this drill with a higher capacity pack, 3.0Ah or larger, just to be on the safe side of things. Although, I don’t think I’ve ever seen a performance difference when using Dewalt 20V Max tools with lower capacity packs. If you’re using regular masonry drill bits, you’re not going to have an easy time going through rebar. There are specialty bits that are meant for drilling into rebar-reinforced concrete. Is your drill bit relatively new and in good shape? I was using a brand new Milwaukee SDS drill bit – it was very blunt after though ! Getting a bigger and better batter yto run this would add another $100 to the price, which for the limited amount of use it’ll get is cost overkill. Man got this rotary hammer two batteries a charger a case and a new impact driver for 300 bucks from Home depot. Ive used it on a bunch of different size bits and materials and as of now it rocks. Alot of people down the cordless rotary hammers for not being like a corded model but thats dumb. The 4ah batteries ran alot longer than i though drilling for 1/4 tapcons in concrete!! !